Well today I've got a lot of coding and forum work to do. We released Twilight of the Arnor and people seem happy. But I'm not convinced that all the final strings got in (i.e. tech descriptions). And while we did release the info guide and a twilight manual, I want to keep updating them as well as hang out on the forums answering questions and helping. Unfortunately, my middle right finger is swollen up. As some of you know, I keep bees. I've got 6 honey bee hives this year. 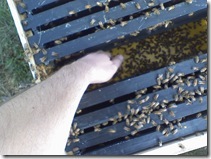 The hives are located at the back of the Stardock property (well away from the building). 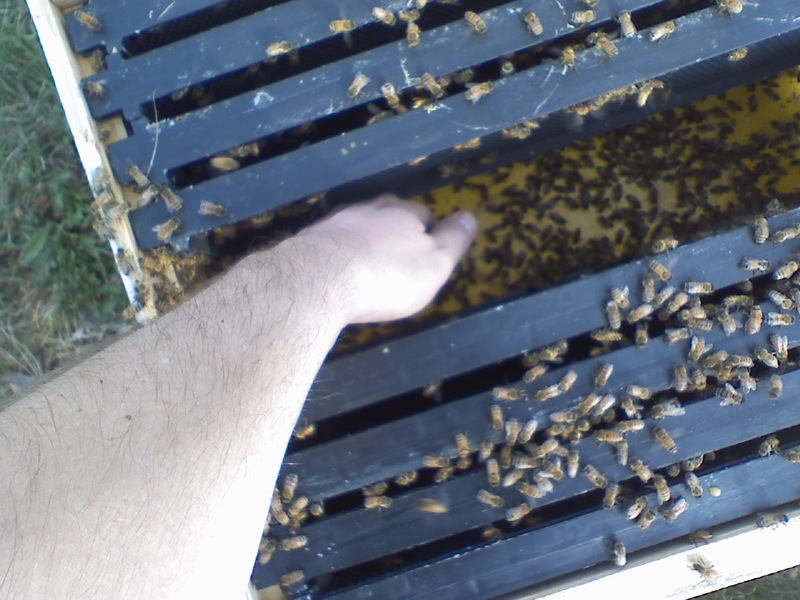 So yesterday I was out there working on them getting rid of bur comb inside a hive when I got stung. At the same time, I got a cell phone call which I needed to take. So I had to leave the stinger in me (pumping away) for a bit. When I got off the phone, I scratched it out. I'm immune to bee stings in general but leaving the stinger in so long caused my middle finger to swell up a bit today (you wouldn't notice it unless I pointed it out) causing it to be a bit stiff. So it's slowing down my typing speed a tad. Hey, I too am into beekeeping. I'm glad to hear your into it too. Stings just come with the territory, as you no doubt know. I've had a lot of luck cutting down on it by using cover cloths. Have you tried using 'em? It makes for a little extra work, but the bees seem a bit less excited. Anyway, that's an ouchy place to get stung and all that extra vemon makes for a sore finger. Hey, look on the bright side....they say it's good for arthritis. Well, that makes you now 2:0 now for achievements against me. you don't have the phobia against bugs/bees that I do...heck, maybe I should up you to a 3:0 since you're willing to put your hand INTO a hive. Yes, I scream like a girl and run whenever I'm around bees...makes it hard to help my wife out at her work on weekends, she works at a plant nursery. Sorry to hear about the sting. Since you keep honey bees, do you have any ideas on why they seem to be disappearing in the wild? Ouch! Take care of yourself. I don't do well with stinging insects of any kind. Lousy ungrateful bees. You give them a home, and even do a little housekeeping for them, and this is the thanks you get? why do you guys keep bee hives near your office? You do realize that a section of your visual cortex that lets you know what circles are versus what triangles are is probably more massive than an entire bee let alone the bee's wee little brain. I say we give them some slack for being stupid and ungrateful. Well, that's what you get for minding your own bees wax, I guess. Seven years ago, your psychology teacher told the class that the visual cortex was the size of a large bee, and you've been waiting to drop that nugget of trivia ever since, haven't you? On topic: seriously, bees are horrifying to me. I scream like a little girl when anything with a stinger approaches and make my fiancee kill it. Oh man, that's like the worst job I could possibly have. I don't just scream like a little girl when bees approach, I usually try to run inside to evade them! Research stingers to get up to yellow jackets and hornets. The middle finger is the finger of judgement!!!! Man, you're just lucky you didn't get hit by a Harpoon. That's where the office defense system's trained attack bees come from. Something like dogs with bees in their mouths, etc. ?